A couple of days ago, the Google counter reached 250. 250!! I had no idea when I started this blog last July that it would grow to have 100 followers, even less 250. I had no idea I would love it so much and even though I'm taking a bit of a break right now I truly appreciate your vote of confidence. I met wonderful people online and in real life, supportive, loving, fun, creative people, new friends even from across half of the globe that make me feel happier. This is my thanks to you. 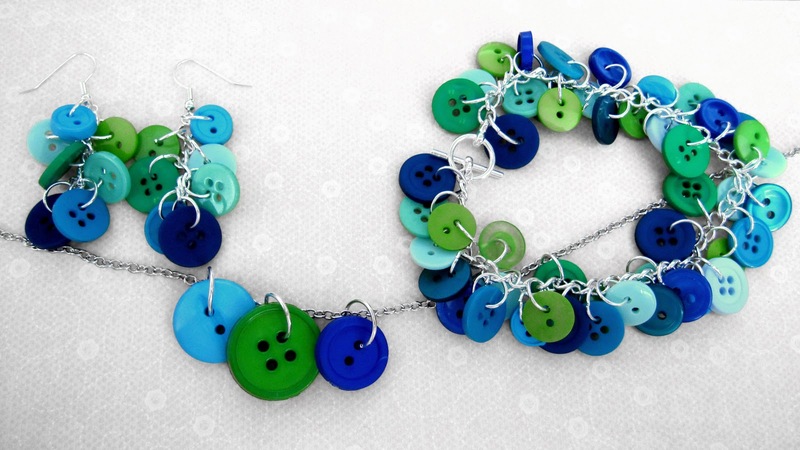 I mentionned it earlier, Amie from Kittycats and Aiplanes has been secretly preparing a special treat : she created a complete set of her adorable button jewelry just for the occasion. So there it is, one of my lucky readers will win the complete set : necklace, pendant earring and bracelet. - Mandatory: Be a follower from Google Friend Connect and comment on this post letting me know which craft you like the best (sewing, knitting, scrap booking or ???) - one entry person. Congratulations! I'm one of your 250 followers. Sewing is my favourite hobby. So many possibilities! I am a new blogger and your newest follower. At this point, I have so many projects started I can't pick which I like best. I'm a new follower! I Love crafting & couldn't choose just one ;) I'm doing wood crafts right now. I follow you. I love to do several types of crafts but my favorite is probably sewing. My favourite hobby would have to be a toss up between sewing and painting. I follow Atelier Caroline on FB! I just became a follower on facebook. I love to stamp. Last November I was introduced to string beading. I love it. I am your 268 follower. I love stamping. I would love to knit. I like you on FB now, and am a new follower :) Glad to have found your blog. Your newwest follower is a bit fickle today......I can't seem to chhose a favorite medium. However I currently have five crochet projects going, One needlepoint project, one embellished cross Stitch project, a few beading projects, four or five plastic canvas projects and three flower arrangements to choose from so you can see my dilema, right? Most importantly I desperately need to win the button jewelry because....my name is BUTTONS! Well, enough rambling,Congratulations on your blog milestone! I'm stopping by from the Relax and Surf Sunday Blog Hop and I'm your newest follower. Also following on Facebook. If you get a minute please stop by and follow back. Well now I am your newest follower!! My favorite craft right now is sewing...but I get bored and may switch that thought to knitting soon! BTW your little pink heart necklace is sweet! I am following you now, and I like sewing! I follow you. I love all types and don't have a favorite! Congrats! New follower! I love all types of crats but I unfortunately can not do all types of crafts! I knit when I was younger and just stopped - not usre I even remember how any more. So I have to say my fave would be scrapbooking bc it's the one I can do! I wish I were more crafty! Hello...I am your newest follower via a sunday blog hop...I love to stamp in altered journals...I love your blog...Congrats on 250..before you know it you will be at 300..
Congrats on your blog growing so rapidly! Happy Valentine's Day! I am your new follower from the Relax & Surf blog hop!